The ejections will bring the embassy numbers in Moscow and Washington to 455. Photo by Agencies. Russian President Vladimir Putin has announced that 755 staff must leave US diplomatic missions in retaliation for new US sanctions against Moscow. The decision to expel staff was made on Friday but Putin has now confirmed the number who must go by 1 September. 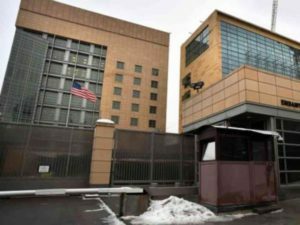 The number includes Russian employees of the US diplomatic missions across Russia, the BBC’s Sarah Rainsford in Moscow adds. Staff in the embassy in Moscow as well as the consulates in Ekaterinburg, Vladivostok and St Petersburg are affected, she says. Putin did strike a conciliatory note, saying he did not want to impose more measures, but also said he could not see ties changing “anytime soon”.